If you're a guitar scales beginner, this lesson will give you a basic introduction to the world of scales. You should read through this page before you move on to learning individual scales. Please make sure you've been through my lesson on intervals as it complements this lesson. The obvious place to begin is to ask the question: what is a scale? A scale is, simply put, an ordered and repeating sequence of tones (or notes if you like). For lead guitar playing (e.g. 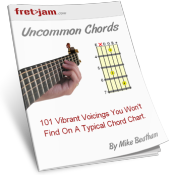 soloing), scales provide the roadmap for playing musically over chords. In other words, they help you choose notes that will sound good. Scales typically consist of five or more tones, the most common being five-tone (pentatonic) and seven-tone (heptatonic) scales. But before we look at those, there's one scale that can be considered the "grand daddy" of them all! The best way to describe the chromatic scale is all twelve notes on the guitar ordered consecutively in sequence. For example, take the 3rd string of your guitar. Played open (unfretted) it is the note G (in standard tuning). Each note represents a degree of the scale, and vice versa. So the chromatic scale has 12 degrees, each one being assigned a degree number. 1 always marks the start of the scale, so once we get to G at the 12th fret, we're back at 1 again and the sequence of degrees and notes repeats from there. You could also apply the chromatic scale to any other string (e.g. open A to 12th fret A, open B to 12th fret B etc.) and we'd number the degrees in exactly the same way - 1 to 12. If you've taken the foundation fretboard lessons (highly recommended!) you'll know that there are 12 notes in total on the guitar fretboard. No matter which note we start on, the chromatic scale is numbered 1 to 12, without any gaps - 12 consecutive semitones, in other words. Now, the chromatic scale isn't used much as a musical scale because it's not very... musical. But theoretically, this scale is the most elementary scale of them all, as it includes every note we will ever use. These spaces are known as intervals. More on that later. The 12th fret G, which is where the scale reaches 1 again, is known as the octave. This is another way of saying "same as the 1 but higher in pitch". A higher sounding 1, in other words. But it's still the same note as the 1, therefore we consider it as the 1st degree. The scale sequence repeats from this new 1. Side note: Sometimes you'll see the octave written as "8". This is just another way of saying "same note as the 1 but twelve semitones higher in pitch". In my lessons, I always refer to octaves as "1" for consistency. That diagram above is a G scale because we started on the note G. In other words, G is the 1st degree or 1 in the scale, also called the root note. The root note tells us what letter to name the scale with. As time goes on, you'll learn how significant this is. Side note: When naming our scale notes, we ensure they follow an alphabetical sequence. That's why we used C♯ in the above scale and not D♭, because there's already a D in the scale. In other words, each letter should only appear once in the sequence, which determines whether we use a sharp or flat on the appropriate notes. When playing a scale, you won't necessarily always start on the root note, but just knowing what the root note is in the scale is the important thing. These spaces between the scale degrees can be labelled as a half step (H) or whole step (W). These are the building blocks of scales. Across one string, a half step can be thought of as the next fret along. A whole step can be thought of as two frets along. You'll see both depending on which resource you use. I prefer to use H and W.
This sequence of half and whole steps is one way of writing out the scale formula. It's a short-hand way of telling us the sequence of the scale, starting on ANY root we might choose. So that's ultimately what scales are! A sequence of steps/intervals that repeat at the octave. Again, the 1 or root is on G and you can see how the scale repeats at the octave. This is known as a scale pattern. These condensed, four/five fret-wide patterns are sometimes referred to as "box" patterns. They give us a convenient, memorable formation of the scale sequence in a particular position on the neck. The pattern above is in the "root position", because the lowest note in the pattern is the root itself. This gives us a clear starting point for our scale. I'll help you to break down and memorise these larger patterns in their individual lessons. I'll also take you through the process of connecting each scale to the chords you play over, giving us the foundation for creating musical solos. But for now, we have the basics covered. We know what scales are and how they are built (go over this lesson again if you're unsure!). When you're ready, head to the next lesson in the series using the links at the bottom of this page.